Pennisetum verticillatum , R. Br. Setaria verticillata is a native European grass, invading agricultural, urban, and other disturbed areas throughout North America, Central America, South America Africa, Asia, and the North and South Pacific. A problematic crop weed S. verticillata, has inflicted considerable environmental and economic costs, is known to adapt to local conditions rapidly, and has developed resistance to atrazine and other C 1/5 herbicides. Setaria verticillata is a loosely tufted, annual grass. Its culms reach 10–100 cm high or more, geniculately ascending. Leaf-blades broadly linear, 5–30 cm long, 4–16 mm wide, flaccid, glabrous to loosely pilose; sheaths glabrous to pubescent. 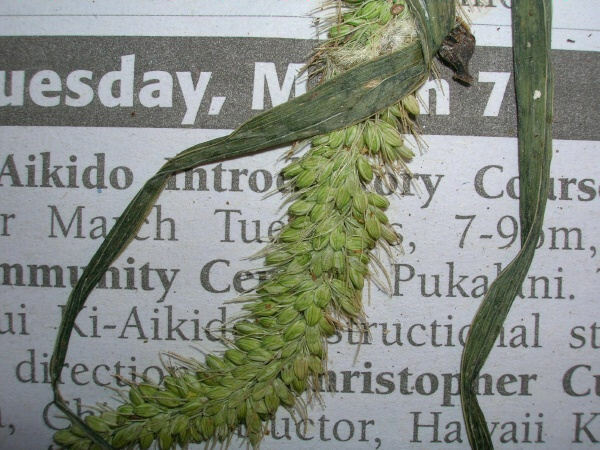 Panicle spiciform, linear to untidily lobed, 2–15 cm long, often entangled, the rhachis hispidulous; bristles 3–8 mm long, retrorsely barbed, tenaciously clinging. Spikelets ellipsoid, 1.5–2.5 mm long; lower glume 1/3–1/2, the upper as long as the spikelet; lower floret sterile, the palea minute; upper lemma finely rugose (Aluka, 2008). 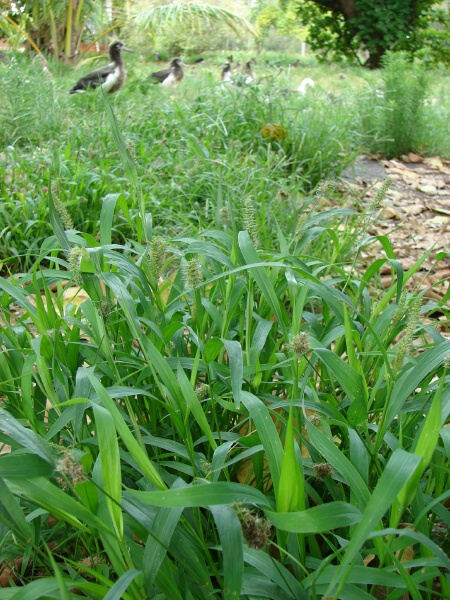 Some authorities recognize Setaria verticillata and Setaria adhaerens as one species while others recognize them as two. The more temperate S. verticillata has ciliate sheath-margins, glabrous blades and spikelets over 2 mm long. The more tropical S. adhaerens has glabrous sheath-margins, hairy blades and spikelets under 2 mm long. However, these are only two among a number of intergrading populations, and some recommend treating the whole complex as a single polymorphic species (Aluka, 2008). In South Africa the seeds of Setaria verticillata are used to produce malt for beer. In Nambia, the Topnaar people harvest S. verticillata seeds and use them in making porridge (Biodiversityexpolorer, undated). Setaria verticillata is a self pollinated annual which forms long-lived, heterogeneous seed pools in the soil resulting from a dormant seed rain. In soil seed pools, after-ripening, the occurrence and timing of seedling emergence, and the induction of secondary, summer dormancy are regulated by seasonally and diurnally varying soil oxygen, water, and temperature signals. This precise and adaptable seed emergence contributes greatly to S. verticillata's success in disturbed areas. It is known to have a considerably low intrapopulation genetic diversity and huge genetic diversity between populations compared to similar plant species (Dekker, 2003). Review: Christos A. Damalas, Department of Agricultural Development of Pieria. 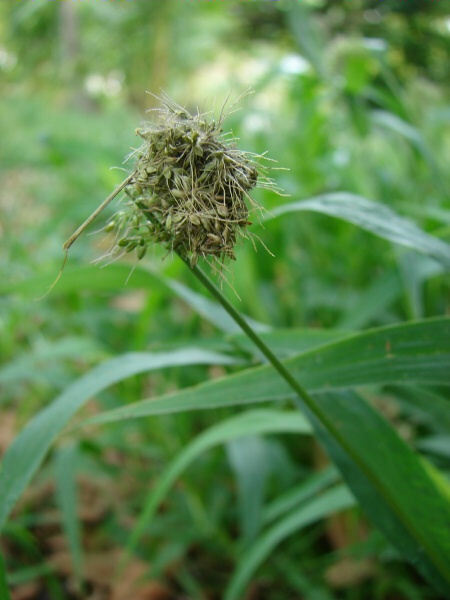 Recommended citation: Global Invasive Species Database (2019) Species profile: Setaria verticillata. Downloaded from http://www.iucngisd.org/gisd/species.php?sc=927 on 22-04-2019. Setaria verticillata is problematic, cosmopolitan crop weed. It has the ability to adapt to a wide range of habitats enabling widespread infestation in temperate, disturbed areas throughout the world. It exhibits phenotypic plasticity and is quite resilient to a number of conditions being resistant to several herbicides, mechanical damage, and drought. Its invasive nature has resulted in significant damage to corn crops and the displacement of native grasses (Dekker, 2003). 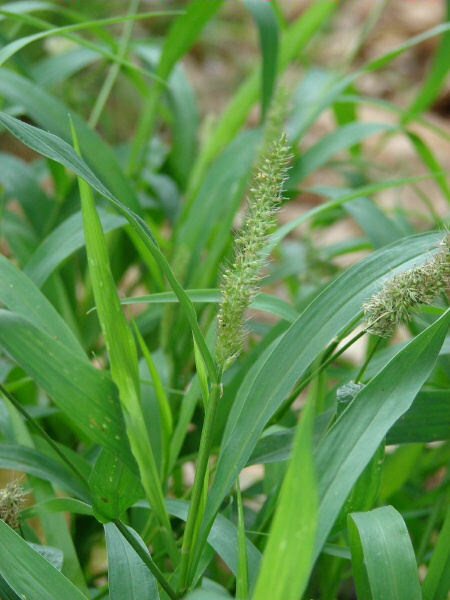 Chemical: Setaria verticillata was found to develop resistance to Photosystem II inhibitors, or C 1/5 herbicides when it became resistant to field levels of atrazine treatment in one study (Gimenez-Espinosa et al, 1996; Heap, undated). Its rates of recovery of net CO2 mg per dm2 per h/h following a treatment of atrazine, cyanazine, and cyprazine at 1.16x10 -5 M leached through silica sand media were 1.5, 0.5, and 0.3 CO2 mg per dm2 respectively (Jensen et al, 1977)..
Informations on Setaria verticillata has been recorded for the following locations. Click on the name for additional informations. Steel, M G; Cavers, P B; Lee S M., 1983. The Biology of Canadian Weeds 59. Setaria glauca and Setaria verticillata. Canadian Journal of Plant Science. 63(3). 1983. 711-726. Amigo, J; Bujan, M; Romero M I., 1991. Taxonomic review of Genus Setaria Gramineae in the Iberian peninsula. Bulletin de la Societe Botanique de France Lettres Botaniques. 138(2). 1991. 155-166. Auquier, P., 1979. The Genus Setaria Poaceae in Belgium and Luxembourg. Lejeunia.(97). 1979. 1-13. Banfi, E., 1989. Notes On Italian Species of Setaria P. Beauv. Poaceae. Atti della Societa Italiana di Scienze Naturali e del Museo Civico di Storia Naturale di Milano. 130(13). 1989. 189-196. Buyankin, V., 1975. New Weeds For The Uralsk Oblast USSR. Botanicheskii Zhurnal (St. Petersburg). 60(8). 1975. 1190-1191. Cox, George W., 2001. An Inventory and Analysis of the Alien Plant Flora of New Mexico. The New Mexico Botanist. A Newsletter for the flora of New Mexico, from the Range Science Herbarium and Cooperative Extension Service, College of Agriculture and Home Economics, New Mexico State University. G�tze, A.R. ; S.S. Cilliers, H. Bezuidenhout and K. Kellner. 2003. Analysis of the riparian vegetation (Ia land type) of the proposed Vhembe-Dongola National Park, Limpopo Province, South Africa. Koedoe 46(2): 45-64. Pretoria. ISSN 0075-6458. Gudzhinskas, Z. A., 1991. Addition to adventive flora of Kaliningrad Oblast: Poaceae. Botanicheskii Zhurnal (St. Petersburg). 76(10). 1991. 1441-1446. Hovenden, Mark J. and Dennis I. Morris., 2002. Occurence and distribution of native and introduced C4 grasses in Tasmania. Australian Journal of Botany, 2002, 50, 667-675. ITIS (Integrated Taxonomic Information System), 2009. Online Database. Setaria verticillata (L.) Beauv. Kaantonen, M., 1976. Notes on the establishment and survival of some adventive plants in the Tampere region South Finland. Memoranda Societatis pro Fauna et Flora Fennica. 52 1976. 15-18. New South Wales Flora Online., 2009. 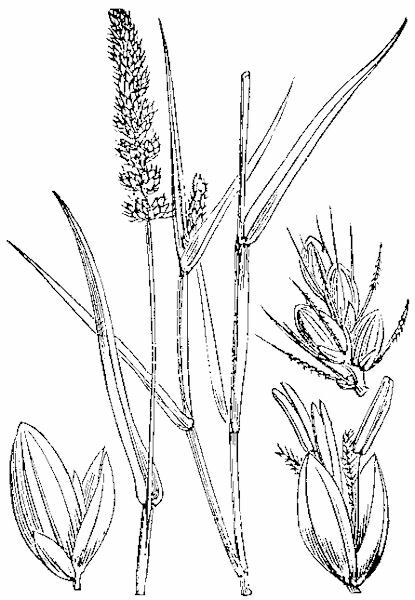 Setaria verticillata (L.) P.Beauv. Pond, U., B.B. Beesley, L.R. Brown & H. Bezuidenhout. 2002. Floristic analysis of the Mountain Zebra National Park, Eastern Cape. Koedoe 45(1): 35�57. Pretoria. ISSN 0075-6458. Rathi, A. S.; Panwar, M. S., 1993. Setaria verticillata: A new host record of Claviceps fusiformis Loveless. Indian Journal of Mycology & Plant Pathology. 23(3). 1993. 332. Rostanski, Krzysztof., 1996. Bristle-grasses (Setaria, Poaceae) in Poland. Fragmenta Floristica et Geobotanica. 41(2). 1996. 507-512. Salimi, H.; Termeh, F., 2002. A study on seed dormancy and germination in ten species of grass weeds. Rostaniha. 3(1-4). 2002. 9-12. Torma, M; Hodi, L., 2002. Reproduction biology of some important monocot weeds in Hungary. Zeitschrift fuer Pflanzenkrankheiten und Pflanzenschutz.(Sp. Iss. 18). 2002. 191-196. USDA, ARS, National Genetic Resources Program., 2009. Germplasm Resources Information Network - (GRIN) [Online Database]. National Germplasm Resources Laboratory, Beltsville, Maryland. USDA, NRCS. 2009. The PLANTS Database (http://plants.usda.gov, 19 June 2008). National Plant Data Center, Baton Rouge, LA 70874-4490 USA. Waldren, S., Weisler, M.I., Hather, J.G. 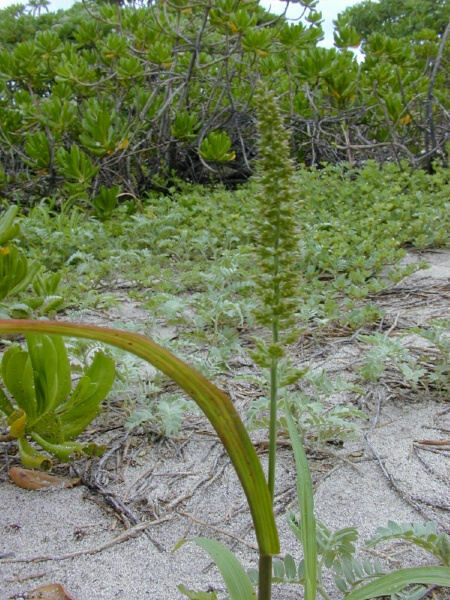 & Morrow, D. 1999 The non-native vascular plants of Henderson Island, South-Central Pacific Ocean. Atoll Research Bulletin 463: 1-14. Department of Agricultural Development of Pieria.